Ahead of the new Moomin animation series Moominvalley, get to know the characters of the Moomin family. The wonderful world of Moominvalley, created by Finnish writer and artist Tove Jansson, is being adapted into a brand new animated series starring Kate Winslet, Rosamund Pike and Taron Egerton. The series will air on Sky One, Sky Kids and Now TV in Spring 2019. Ahead of the new series Moominvalley, get to know the characters of the Moomin family, find out who will be voicing them in the show, and take our quiz to discover which Moomin character you’re most like. 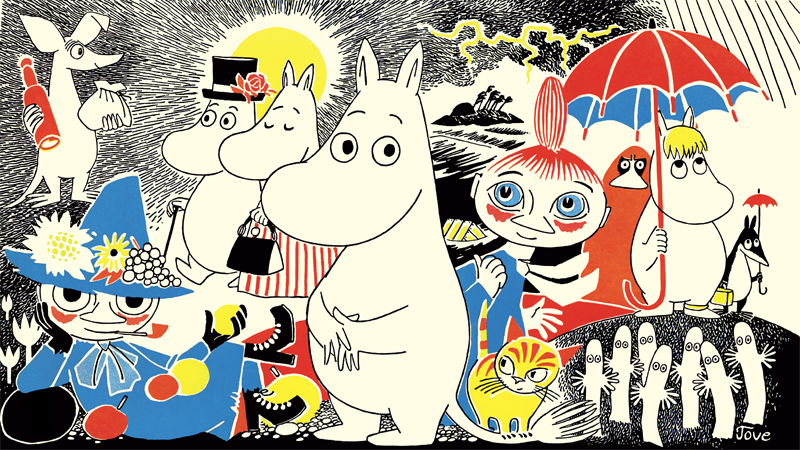 Moominpappa is the head of the Moomin family. He loves his family and worries about their safety, but, at the same time, likes his own space. He likes to give advice and sees himself as a deep thinker. He can be somewhat self-absorbed, and uses most of his spare time writing his memoirs (which he reads out to his family as he completes a chapter). He is very good with his paws - he built the Moominhouse and builds and repairs his boats. He also wears an old-fashioned top hat, which he feels gives him a dignified air, using a walking stick adds to the effect. Momminmamma looks after everyone. She's the organizer of family life with a calm, comforting presence. She is the loving mother to Moomintroll and all his friends. Moominmamma is a very creative Moomin. Each year she makes a beautiful little toy boat out of bark for Moomintroll, which he adores. She tends the garden, makes clothes, and she even paints. Moominmamma rarely goes anywhere without her trusty large, black handbag. Moomintroll is the son and only child of Moominmamma and Moominpappa. He's friendly, loyal and very brave. Once he saved his friends Sniff and Snufkin from a crocodile! Moomintroll's best friend is Snufkin, and Snorkmaiden clearly loves Moomintroll. Moomintroll loves being surrounded by family and friends but, he has a number of special places where he goes to think, such as by the pond and under the jasmine bush. Moomintroll loves adventure with a capital ‘A’. He's saved Little My from freezing ice floes and dived down to the seabed to gather pearls for Moominmamma and Snorkmaiden. Snufkin is a carefree, hat-wearing, harmonica-playing wanderer who is always on the move. Being free to come and go as he pleases is vital to Snufkin. Freedom is everything to him. And if there’s one thing Snufkin hates it’s rules and regulations! He can’t bear being told what to do. Two of his favourite things to do are fishing and walking alone at night. Snufkin is very musical. He plays both flute and harmonica, and even composes his own songs, inspired by nature. When Snufkin is in the right mood, he can be great company. Little My is tiny – small enough to hide in Snufkin’s pocket or to have a nap in Moominmamma’s sewing basket. Despite her tiny size, Little My has a big personality. She says exactly what she thinks and she doesn’t care who hears it. Not surprisingly, her strong opinions can – and often do – annoy others. Little My wears a flame-red dress, which goes with her red hair – always put up in an onion-shaped bun – which goes with her fiery temperament. Because of her independent nature and love of mischief – in other words, sometimes being downright naughty – Little My often gets herself, and others, into scrapes. She sometimes tells whopping great lies. But when push comes to shove, Little My is also very loyal and brave. Sniff looks a bit like a kangaroo with his large ears, slender snout and long tail. Sniff lives in the Moominhouse and hibernates, like the Moomintrolls, but sleeps a week longer than everyone else, which is typical Sniff. Sniff has joined the Moomins on some of their most exciting adventures, on land and sea. The idea of adventures, and with him as the hero, appeal more to Sniff than the reality. He seems to complain about everything and he certainly has a tendency to feel rather sorry for himself a lot of the time! As well as being clumsy, he’s easily scared, competitive in a boastful kind of way and wants to own lots of things - particulary jewels! He trembles with excitement at the sight of precious things! Although Snorkmaiden looks almost identical to Moomins, she's not a Moomin. For one, Snorkmaiden is covered in soft (usually pale green) fluff, whereas Moomins are always white. She has sparkling eyes, long eyelashes and a lovely fringe of hair between her ears: her crowning glory! It's not all about looks but – oh – she does LOVE pretty clothes. Snorkmaiden can be quite sensitive and usually looks to her sweetheart, Moomintroll, for comfort and reassurance. Snorkmaiden is good at making up ideas for games, which usually involve a beautiful heroine and a strong male lead (of the moomin variety). She can be quick thinking and inventive when the need arises. Once, she saved Moomintroll from a giant octopus by holding up her looking glass and dazzling the creature in the eyes! The Snork takes life, and himself, very seriously, and it’s probably a good thing that his sister (Snorkmaiden) bursts his pomposity now and again. He’s sensible and methodical and likes to keep notes in exercise books with lines one inch apart. The Snork likes nothing better than being in charge. Some might even dare to suggest that he’s a little bossy! Character profiles taken from The Moomins: The World of Moominvalley. For more information about the world of Moominvalley, visit the official Moomin website. The Moomins: The World of Moominvalley is the ultimate gift for any Moomin fan, old and new. Filled with illustrated maps and family trees, facts about Moomintroll behaviour and habits, this gorgeous gift book contains all you could wish to know about the beloved characters from the original Moomin stories and the world in which they live. The Moomins: The World of Moominvalley is published in a stunning collectable hardback edition and is available now.